Entertaining the kids on Thanksgiving morning while preparing for your feast can be challenging. 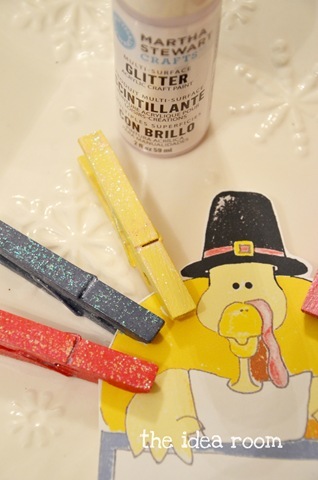 Why not let them entertain themselves with this fun Thanksgiving Game? The premise of the game is fairly simple. Simple enough that even the youngest kids can play. 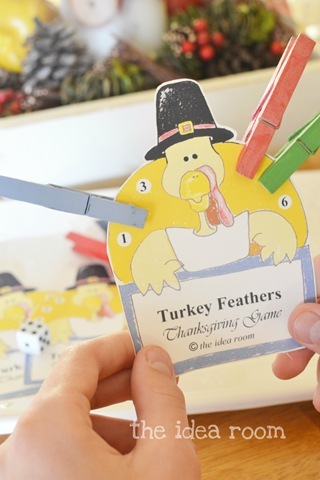 Each player takes a turkey card and gets 6 clothes pins or…Turkey Feathers. Each player takes turns rolling once dice. Then you simply put a feather on the number that you rolled. If you roll a number you already have a feather on, then your turn is over. First person to get all the feathers on their turkey wins. Pretty simple right? 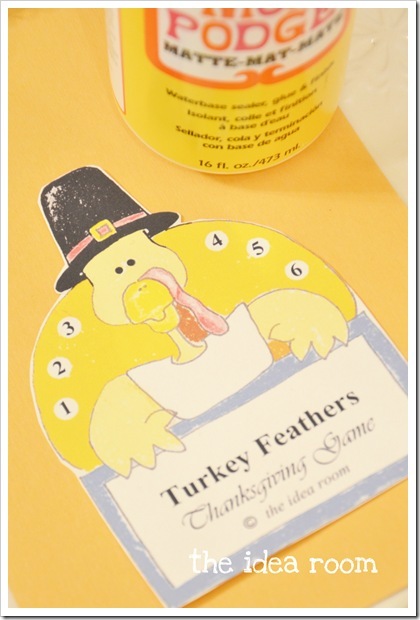 As I am typing this, I realized it might be fun to actually write some of the things you are thankful for on the turkey feathers themselves to help your little ones to be thinking of them while they are playing the game. It would add a little more meaning to the game as well. 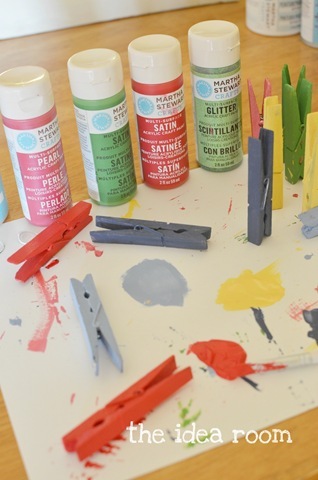 As far as making the game all you will need to do is paint some clothes pins in some fun colors. Each player will need 6 clothes pins, so depending on how many players you have (this game can have lots so it is perfect for big family get togethers). 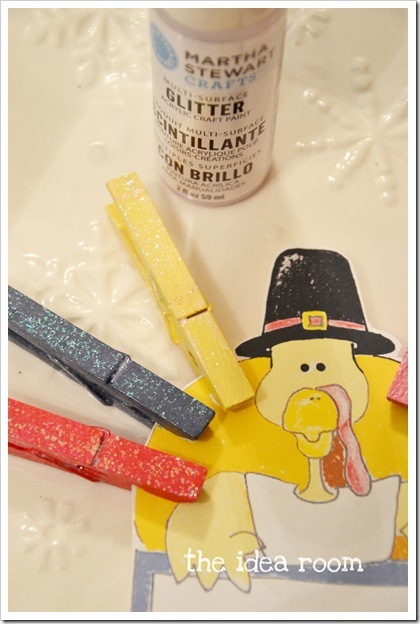 Then since I had some fun Martha Stewart Glitter Paint (which is sold exclusively at Michael’s), I painted a layer of glitter over the regular paint colors to give the Turkey Feathers some pizazz! Then to make them sturdy, I glued them onto some thin cardboard (or you could use some chipboard) with some Mod Podge on the front and back. 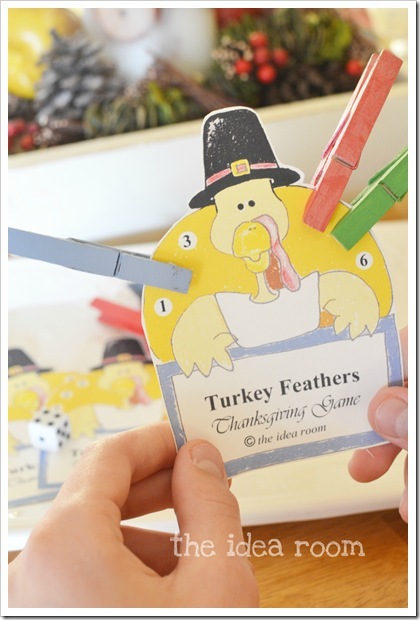 This will help them to last through multiple games with little hands and allow them to be strong enough to hold up the turkey feathers. Hope you enjoy them. I would love to hear from you if you download the games and plan on using them for Thanksgiving this year. This helps me to gage the kind of projects I share with you and the things that you would maybe like to see more of! that is such a cute idea! 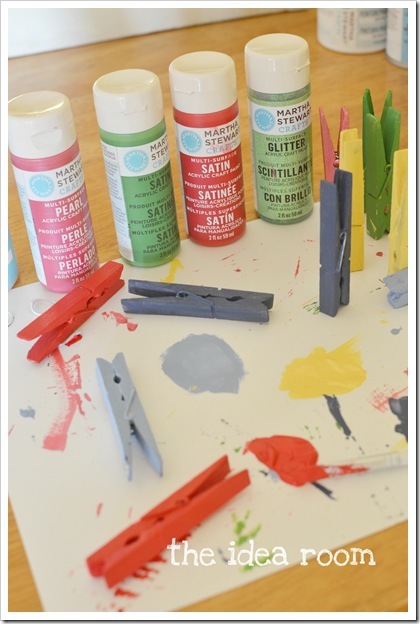 Perfect for a kids craft! thanks for sharing! We will definitely be doing this for family home evening next week! I was looking for something fun to do, this is perfect! Oh how fun… you could even make a grown up version. See who can collect the most “feathers” from people who say words like turkey, pie, stuffing or football. Whoever collects the most feather by the end of the gathering gets a prize! Love this!! Consider this one Done.. I love this.. with 2 small grandsons, this will be a perfect game for Grandma to make and play, while Mommy cooks.. lol.. (first time Ever.. scary???) Thank you for sharing your creativity..
amy, this is such a neat idea! LOVE it. thanks so much for creating and sharing the printables! sharing with my fb friends!! I am currently painting the clothes pins for this game. Thanks for a fun idea. I’m also adding things to be thankful for onto the pins. I love it! I am printing it right now. Thanks! Super cute Idea. I think my boys will be making these this week for Thankgiving. Thanks for the Printable. I love this! We will be having 21 kids 14 and under at thanksgiving. So this is a great little easy game for all ages. Although I don’t think I will be makeing 21! Thanks so much for the idea!! Great idea! Love it…I’m SO adding thankfuls on the back too. LOVE IT!! We are going to do this at Thanksgiving this year. What a great idea, all ages can play this. just by getting the children to learn their numbers and ABCs, and the clip board could chane to Cookie Monster, Scooby Doo, etc etc. Boy I’m on a roll for ideas. Thanks again for the great ideas that you all think of. 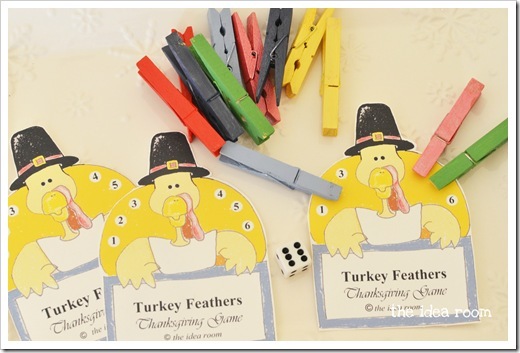 May you all have a safe and Happy Thankgiving Day…..
We made these a couple days ago and my kids have been playing the game everyday! They are so excited to play with their cousins at thanksgiving dinner. Thank you! I have 7 sons ages 20 to 31, we played this game on Thanksgiving, we played for prizes, the first two winners got a can of cashews and the rest got Hershey bars. It got to be pretty competitive ’cause they all wanted those cashews. We were laughing our heads off. My original plan was to have each person say something they were thankful for whenever they pinned a “feather” on, but we were having so much fun I forgot that part, lol. Thanks for the great idea! I am going to use this as the game for my sons kindergarten class they have really been focusing on numbers especially 6 last week so this will be perfect. I did this, but I had my students cut and make construction paper feathers. On each feather they wrote something that they were thankful for. Then they glued or attached the feathers to a paper clip. It worked out nice, the kids enjoyed the game. Thanks so much! 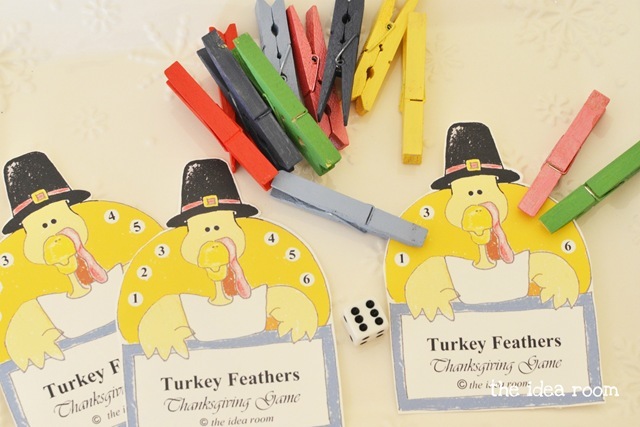 I will be doing this game with my three kids (ages 3-8) this Thanksgiving! I played this with the kids at Thanksgiving ages 3 to 10. It was a hit. We had limited resources so we just colored the clothespins with the crayons on hand and they were happy with that using their own creativity with colors and designs. My 3 almost 4 year old is into the games played with dice right now, like Build a Snowman, etc. so this fit right in. I am so happy to hear that! And yes…kids love being able to help create it. The crayon idea was perfect!! Love the Turkey Feather Game. Double duty with this one, the game pieces will be a craft project for my 9 year old granddaughter while on Thanksgiving vacation and then play the game with family on Thanksgiving Day.